DEAR MAYO CLINIC: What is transcranial magnetic stimulation, and how does it work? Is it effective for treating depression? ANSWER: Transcranial magnetic stimulation, or TMS, is a procedure that uses magnetic fields to stimulate nerve cells in the brain. It's a noninvasive procedure that usually requires about 25 to 30 treatment sessions. Transcranial magnetic stimulation has been shown to effectively improve symptoms of depression, particularly in people who haven't seen improvement with other treatments, such as antidepressant medications and psychotherapy. It's not clear exactly how transcranial magnetic stimulation eases depression. There are several theories, but research suggests that transcranial magnetic stimulation works by stimulating nerve cells in a region of the brain involved in mood control and depression, and activating regions of the brain that have decreased activity in people who have depression. During transcranial magnetic stimulation, a device called a magnetic coil is placed against your scalp near your forehead. It delivers a magnetic pulse, or stimulation, to the brain. During stimulation, you feel a tapping sensation against your head. The coil is switched on and off during the treatment session. Although the specific amount of magnetic energy that's needed varies from one person to another, a four-second stimulation typically is followed by a 26-second pause. One session usually lasts about 40 minutes. 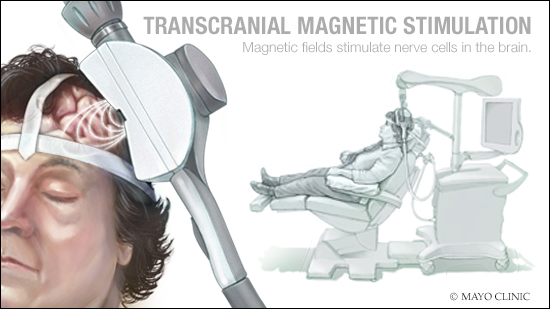 Transcranial magnetic stimulation treatment is provided in a doctor's office and does not require a hospital stay. Research has shown that daily treatments, five days a week for five to six weeks, provide the best symptom relief. Most people don't begin to feel better until they've had several weeks of treatment. Transcranial magnetic stimulation doesn't work for everyone, and it's not a long-lasting cure. But when it works, depression symptoms often improve significantly, or they may go away completely. Continued treatment usually is not recommended as a preventive measure if you are symptom-free after six weeks of TMS. But if symptoms return or get worse again after treatment is finished, you may be able to repeat transcranial magnetic stimulation. There can be some side effects as a result of transcranial magnetic stimulation, but usually they are mild. Common side effects include a headache, scalp discomfort and lightheadedness during treatment sessions. You may notice tingling, twitching or spasms in facial muscles, too. Some people wonder if TMS is similar to electroconvulsive therapy, or ECT — a treatment for depression in which electric currents are passed through the brain. As with transcranial magnetic stimulation, electroconvulsive therapy may be used when standard depression therapies haven't worked. It also may be recommended in cases of severe depression. Transcranial magnetic stimulation is different from electroconvulsive therapy in a number of ways. First, electroconvulsive therapy requires general anesthesia and possibly a hospital stay; transcranial magnetic stimulation does not. Second, electroconvulsive therapy carries a risk of confusion and memory loss. These side effects have not been seen in people undergoing transcranial magnetic stimulation. Third, electroconvulsive therapy intentionally triggers a brief seizure as part of the treatment. Transcranial magnetic stimulation does not cause seizures. One drawback to TMS is the cost — about $10,000 for six weeks of treatment. Medical insurance companies don't always cover this treatment. Transcranial magnetic stimulation is approved by the U.S. Food and Drug Administration to treat depression after one antidepressant medication has been unsuccessful at controlling depression symptoms. But many insurers require patients to try at least four different antidepressants before they will cover TMS. So be sure to check your insurance coverage if you are considering transcranial magnetic stimulation treatment.